Imaging the objects that are beyond the visible region is of the interest in both terrestrial and astronomical applications. Imaging an object in infrared will reveal its physical characteristics and heat signature. IR imaging can be broadly divided as active IR imaging and passive IR imaging. Both active and passive imaging systems combindly known as \'Night vision\' systems means, \'vision under darkness\' . Active systems for example \' Night vision goggle or \'Night vision filters\' that work in NIR region require ambient IR light to illuminate the object typically either with star light or by projection from the optical system itself. Passive night vision systems that works in FIR region images the scenes based on the surface temperature by detecting the infrared radiation that emanates from the objects and surrounding environment. Thermal imaging has applications in defense, industrial security, transportation, cancer detection, body scans, and hot-spot detection. Germanium, Silicon and Zinc Sulphide are the mainly used optical components in thermal imaging systems. Silicon is the material of interest in 3-5 micron band where as germanium is the widely used material in 8-12 microns band. HHV has already developed the AR and beamsplitter coatings that are required for night vision binoculars. 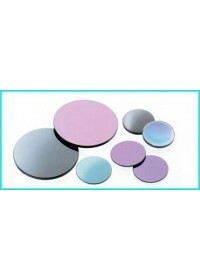 Now HHV has developed antireflection coatings on germanium in 8-12 micron region.